Myrrh (Commiphora molmol, C. abyssinica, or C. myrrha) is a close relative and member of the Burseraceae family, native to the eastern Mediterranean, Ethiopia, the Arabian peninsula, and Somalia. Myrrh is a shrubby desert tree known variously as gum, myrrh tree, guggal gum, guggal resin, didin, and didthin. Myrrh is an Arabic word meaning bitter. 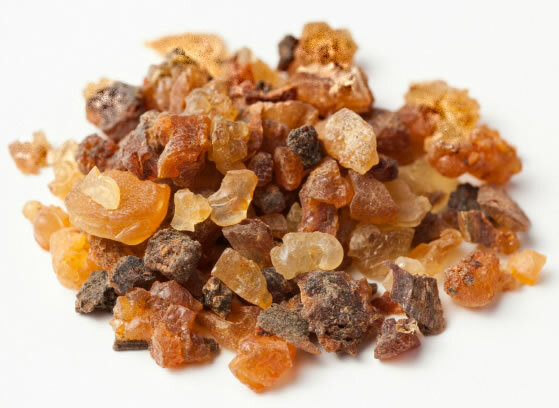 The highly valued aromatic gum resin of myrrh has a bitter, pungent taste and a sweet, pleasing aroma. A particularly treasured variety of myrrh is known as karam or Turkish myrrh. Myrrh grows to a height of about 9 ft (2.7 m). The light gray trunk is thick and the main branches are knotted with smaller branches protruding at a right angle and ending in sharp spines. 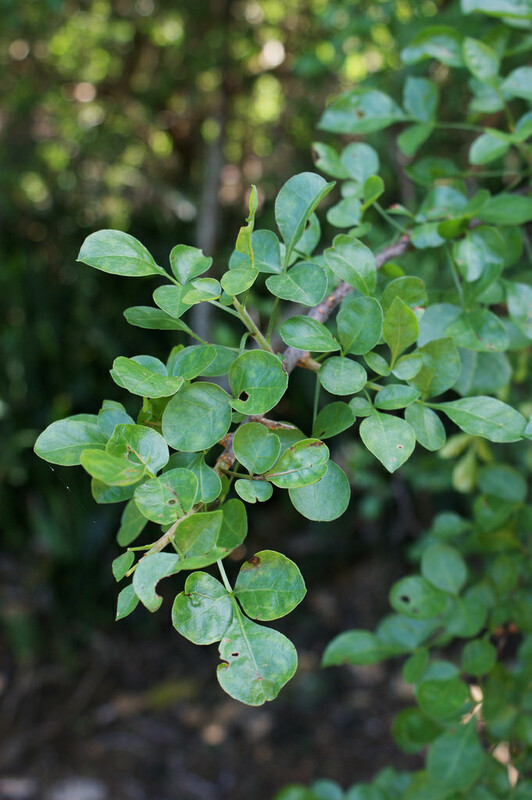 The hairless, roughly toothed leaves are divided into one pair of small, oval leaflets with a larger, terminal leaflet. The yellow-red flowers grow on stalks in an elongated and branching cluster. The small brown fruit is oval, tapering to a point. During the time of the Egyptian pharaoh Thutmose III, around the fifteenth century B.C., the pharaoh’s aunt, Queen Hatshepsut, sent an expedition to Africa and the “Land of Punt” where myrrh trees were abundant. The Queen wanted to please the god Amon by surrounding his temple with living myrrh trees. The mission was successful and the story of the expedition was depicted on the walls of the temple built to enclose the Queen’s tomb. According to legend Queen Hatshepsut was promised “life, stability and satisfaction forever” by the well-pleased god, and the revered myrrh tree was introduced to the Egyptian people. Myrrh has been used since ancient times in incense, perfumes, and holy ointments. The Egyptians used myrrh in embalming compounds and burned pellets of myrrh to repel fleas. Archeological evidence indicates that myrrh was carried in small pouches that wealthy persons hung around the neck for fragrance. The Ebers Papyrus, believed to have been found in the necropolis outside Thebes, provides evidence of Egyptian medicinal use of myrrh. This ancient document contains as many as 800 medicinal recipes using such plants as myrrh, peppermint, aloe, castor oil, and numerous other herbs in common use today. Myrrh was mentioned in the bible as a component of the bitter solution offered to the crucified Jesus during Roman times. The herb was traditionally mixed with wine and offered to prisoners prior to execution to ease pain. The use of myrrh medicinally was recorded in China in A.D. 600 during the Tang Dynasty. Myrrh is used today in Chinese medicine to treat wounds, relieve painful swelling, and to treat menstrual pain due to blood stagnation. Myrrh is called mo yao in China. Myrrh was a highly valued commodity for commerce on ancient spice routes, and is woven into legend and myth. In Syrian legend the myrrh tree is named for the daughter of Thesis, a Syrian king. She was transformed by the gods into a myrrh tree to escape her father’s murderous wrath. 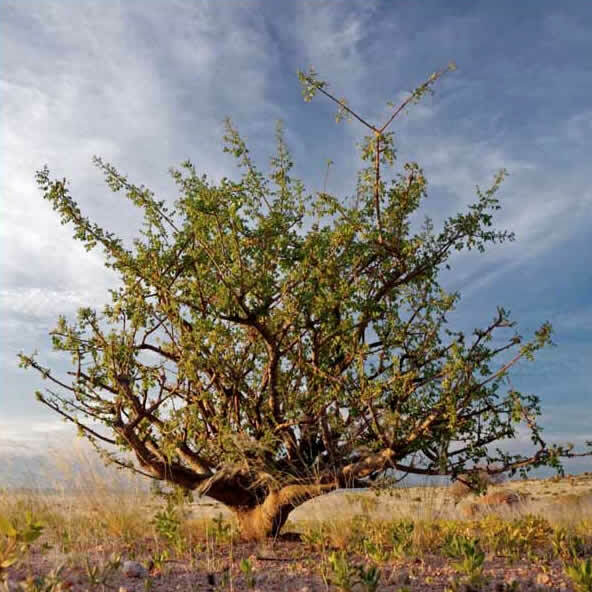 Myrrh is the sweet-smelling oleo-gum resin that naturally exudes from wounds or cuts in the stems and bark of several species of this shrubby desert tree. This sap forms a thick, pale yellow paste as it seeps out. It then hardens into a mass about the size of a walnut, taking on a reddish-brown color. The volatile oil contained in the resin consists of sesquiterpenes, triterpenes, and mucilage. The tannin content gives myrrh its astringent action. Powdered myrrh has been endorsed by the German advisory Commission E as a beneficial treatment for mild inflammations in the throat and mouth. Myrrh acts as a broad-spectrum antiseptic and can be applied directly to sores and wounds. Taken internally in tincture or capsule form, myrrh is a beneficial treatment for loose teeth, gingivitis, and bad breath. The tincture may also be applied directly to a tooth to relieve tooth ache. It is antifungal, and has been used to treat athlete’s foot and candida. Some research indicates that myrrh is effective in reducing cholesterol levels. It is a tonic remedy said to relax smooth muscles, increase peristaltic action, and stimulate gastric secretions. The myrrh resin has antimicrobial properties and acts to stimulate macrophage activity in the blood stream. The herb is being studied for its potential as an anticancer medication. Taken internally in tincture or capsule form, myrrh is useful for relieving gastric distress and as an expectorant, though this folk application has not been confirmed by experimental evidence. Myrrh is burned as incense and used to repel mosquitoes. It is also a component in healing salves used in veterinary medicine. In Chinese medicine, it is used for wounds, bruises, and bleeding. Myrrh is available in capsule, powder, and tincture form. It is pulverized into powder, and prepared as atincture. It is found combined with other ingredients in dental powders, mouthwash preparations, and toothpaste. Myrrh is used as fragrance in cosmetics, perfumes, and soaps, and as flavoring in foods. Tincture: Four ounces of powdered myrrh are combined with 1 pt of brandy, gin, or vodka in a glass container, with enough alcohol to cover the herb. A 50/50 ratio of alcohol to water is generally recommended. The mixture should be placed away from light for about two weeks, and shaken several times each day. Strain and store in a tightly capped, dark glass bottle. A standard dose is 1 or 2 ml of the tincture three times a day. Essential oil: Myrrh’s essential oil is pale yellow to amber in color. It is obtained by steam distillation. The essential oil is commercially available from numerous sources. It is said to be beneficial when used as a chest rub to treat bronchitis, and externally in diluted form on ulcers and wounds. Gargle: One teaspoon of dry, powdered myrrh should be combined with 1 tsp of boric acid. One pint of boiling water is poured over the mixture and steeped for 30 minutes, then strained. This mixture is a good gargle preparation, according to herbalist John Lust. Myrrh should be avoided during pregnancy and should not be administered to children. It should be kept away from the eyes and mucous membranes and out of children’s reach.